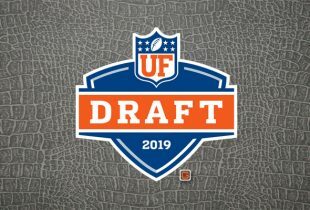 ONLY GATORS Get Out Alive will be covering the 10 former Florida Gators players who have been officially invited to participate in the 2010 NFL Scouting Combine (National Invitational Camp) in Indianapolis, IN, at Lucas Oil Stadium each day. Days six and seven of the 2010 NFL Scouting Combine featured five former Florida Gators completing their workouts. Monday, linebacker Brandon Spikes and defensive ends Carlos Dunlap and Jermaine Cunningham completed the combine workout. Cornerback Joe Haden and safety Major Wright closed out the event on Tuesday. Broad jump: 9 ft. 2 in. Broad jump: 9 ft. 3 in. Bench press: 21 reps of 225 lbs. Broad jump: 10 ft. 5 in. Bench press: 18 reps of 225 lbs. Bench press: 14 reps of 225 lbs. All 10 Gators have now completed their duties at the combine. They will each return to their respective training facilities across the country before meeting up again in Gainesville, FL, on March 17 for Florida’s Pro Day. The event, which ran from Feb. 24 to March 2, consisted of more than 300 players being put through a series of drills, tests and interviews while more than 600 NFL personnel in attendance including coaching staffs, executives, player personnel and medical staff looked on and evaluated each of them. It amounts to the final job interview these athletes will participate in before the 2010 NFL Draft commences on April 22. I am surprised Haden didn’t lay down a better time…hopefully it doesn’t cause him to slip out of the top 10? I though i watched Haden only get about 19 reps on the bench press. 35 is getting up in the lineman range. Yeah, it was a typo. Fixed. Dunlaps bench seem a little weak for a DE? Saw McShaw was back to bashing Florida players this morning, guess it’s been almost 48 hours not knocking some UF player down.